San Francisco Rugby club was founded in 1966 - In 1969, Rugby Magazine nominated San Francisco RFC as the Number One Team in the USA (equivalent to what is now the National Championship). City also won the Aspen Tournament, which for many years remained one of the premier tournaments in the USA now known as the Aspen Ruggerfest. In the ’70s, the club fielded five teams on a regular basis and made several overseas tours, which included England and Wales, New Zealand, Hong Kong and the Orient. San Francisco RFC was a regular participant in the Monterey Rugby Tournament and the Golden Gate Tournament, which was founded in 1970 to celebrate the Centenary of Golden Gate Park. The ’80s brought an increasing percentage of US-born players into the club, reflecting the increasing popularity of the game in the country. The club’s strong support of youth rugby programs also contributed greatly to this trend. 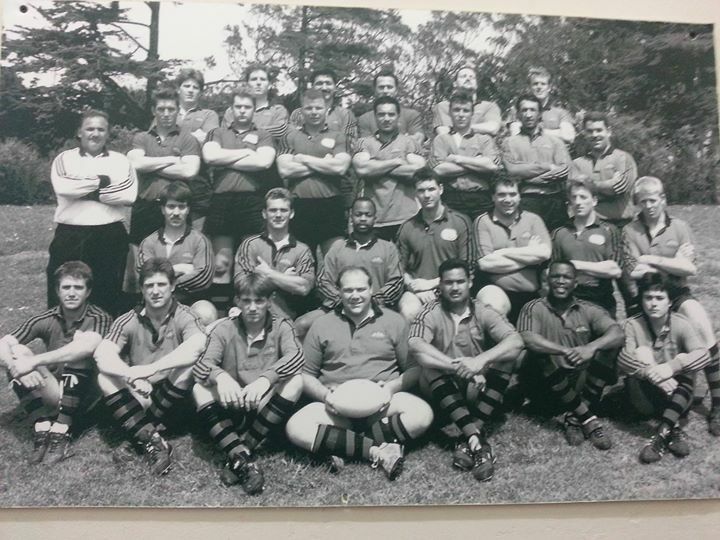 At one time, San Francisco RFC was providing coaches to seven different high schools in the Bay Area. San Francisco RFC continued to play excellent rugby throughout the ’90s as a mainstay of Northern California 1st Division rugby. A number of key SFGG players were a part of San Francisco RFC in this era, including current former Norcal Squad captain Mike Walker, Toby Jackson, Johnny Mitchell and Brendan ‘Boody’ Dobel. The Golden Gate Rugby Club was formed in 1988 through the merger of two Division II clubs–the Castaways and Barbary Coast. The two teams merged in a bid to enter Division I and quickly became a powerhouse in national rugby circles. Several founding members of Golden Gate are still heavily involved with SFGG Rugby, including Greg Rocca, Greg Schmidt, Mike Roddy and Jon Spear. The club was a regular participant in playoffs and finals for the Pacific Coast championship through the ’90s. In 1996, the club made it to the “Final Four” of the USA National Club Championships in Chicago. In 1999 and 2000, Golden Gate made it to the National Final Four, reaching the championship game in 1999. High profile players in this era include the USA’s most capped centre, Mark Scharrenberg, powerhouse flanker Olo Fifita, and USA players Britt Howard and Steve O’Boyle. Former players Grant Wells, Karl Thomson and Robbie Flynn were also important members of the late 90’s squads. San Francisco RFC and Golden Gate merged in 2001. San Francisco Golden Gate (SFGG) Rugby competed in the Rugby Super League, America’s premier division of rugby union. The Club reached the RSL post-season in all 7 years after it was formed. In the first three years, the Club made it to the quarter finals; cementing the position as one of the top eight teams in the country. In 2004 an undefeated regular season saw a RSL grand final that was lost, 24-21 to Belmont Shore RFC (LA). In 2007, the RSL team reached the semi-finals before being defeated again by the eventual champions Belmont Shore. In 2008, SFGG lost to eventual champions New York Athletic Club. The 2011 season witnessed a comprehensive clean sweep of the RSL Championship as SFGG defeated Life University in Atlanta 20 – 15. In 2012, SFGG fell to OPSB in the semi-finals in the final year of the RSL. In 2013, the RSL was replaced by the Elite Cup as the top club competition in the USA. SFGG won the final in Glendale, CO over Life University 31-26. In 2014, SFGG was one of the founding members of the Pacific Rugby Premiership (PRP). SFGG won the PRP in 2014, and was runner up to Glendale in 2015 and 2016. In addition to excellent results on the field, SFGG Rugby is proud of its record of producing players for Professional and National teams. Numerous past and present USA Eagles have played for SFGG. Past international players include Shawn Pittman, Saimone Laulaupeeaulu, Mose Timoteo, Shaun Paga, Mike McDonald, Matt Sherman, Pat Guire, Britt Howard, Robbie Flynn, Paul Jennings, Jay Wilkerson, Grant Wells, Karl Thomson, Mark Scharrenberg, Steve O’Boyle, Aaron Satchwell, Olo Fifita, Sam Vacaand, Jay Hansen, Tasi Moungaand Jone Naqica. In recent years, Danny Barrett, Folau Niua, Don Pati, Nick Civetta, Seamus Kelly and Thretton Palamo have all represented the USA. Our reputation and club strength also drew Wallaby World Cup champion Tony Daly, who captained our 2003 RSL team. He is the most capped foreign national who has come to play in the United States. Samu Manoa, an integral member of the successful 2011 RSL side, signed with Northampton Saints in the UK for the 2011-12 season. Samu was an integral part of The Saints side that won the Premiership in 2014. He went on to sign a multi-year contract with European Champions Toulon RTC starting in 2015.